The Karma Police guitarist has posted a sly dig to the network on his Twitter profile, following Katherine Timpf's assessment of their music. Jonny Greenwood has hit back at Fox News after a correspondent dismissed their music as "elaborate moaning and whining". 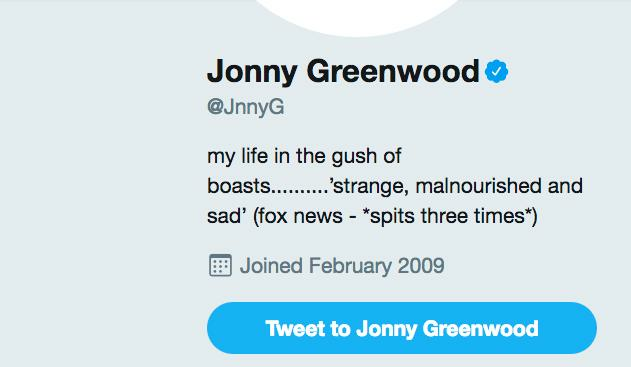 One for subtlety, the Radiohead guitarist has since changed his profile information to read: "my life in the gush of boasts..........’strange, malnourished and sad’ (fox news - *spits three times*)". His wry update is a response to correspondent Katherine Timpf, who when asked about this year's Rock 'N' Roll Hall of Fame list, said: "If it's about fame and not talent I think that Radiohead are definitely going to get in, and should get in. "I don't even like them, but the kind of guys I like have to be three things: strange, malnourished and sad and those guys always like Radiohead." She concluded: "So I've been pretending to like Radiohead for years to get these men even though the music is just elaborate moaning and whining over ringtone sounds." Radiohead might sound like moaning and whining to Timph, but thousands of fans were ecstatic to see Thom Yorke and co. headline Glastonbury Festival this year... especially when they treated the crowd to a performance of Creep.